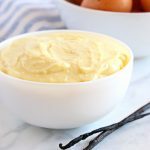 This Easy Homemade Vanilla Bean Pastry Cream is the perfect simple recipe for homemade creme patisserie, a french-style custard or pastry cream made with real vanilla beans! Add the whole milk to a small pot over medium heat. Scrape the seeds out of the vanilla beans and add the seeds to the milk. Toss in the vanilla bean pods too, as they help infuse the milk with more vanilla flavour. When the milk heats to a low simmer, reduce the heat to low. In a medium heat-safe bowl (use a pyrex bowl for best results) add the egg yolks, sugar, and cornstarch. Whisk vigorously to combine until the mixture begins to turn slightly pale and is very smooth. Remove the vanilla bean pods from the hot milk. Very slowly and carefully, pour a small amount of milk (a few tablespoons at a time) into the egg yolk mixture, whisking constantly. This process is called tempering - the egg yolk mixture heats up slowly as the milk is added so as not to cook the egg yolks. If this happens, you'll have scrambled eggs in your pastry cream, which nobody wants! Continue adding the milk very slowly, whisking constantly, until all the milk is added. As more milk is added you can increase the speed at which you pour in the milk. Once all the milk has been added, return the entire mixture to the pot and set the heat to medium. Whisk regularly until the mixture heats up and when the mixture begins to thicken, whisk constantly until a thick, pudding-like texture is reached. Add the butter to a clean bowl and strain the pastry cream into the bowl over top of the butter, causing it to melt. Stir the butter into the pastry cream very gently with a rubber spatula. Cover the pastry cream with plastic wrap, making sure the plastic wrap is directly on top of the pastry cream, with no air between the pastry cream and the plastic wrap. This will prevent a skin from forming as the pastry cream cools. Allow the pastry cream to cool at room temperature for about 30 minutes and then place it in the fridge for about 2 hours or overnight. After it has cooled, pipe it into tart shells, serve it with cakes or pastries, enjoy it with ice cream, or even with a spoon if you like!